Saturday mornings, for me, have always been reminiscent of my childhood, where I would wake up, bleary-eyed, watch my favorite cartoons, and eagerly wait while my parents made us a hearty breakfast. It resulted in us all sitting at the table, enjoying the finished masterpiece together, and creating memories, while sounds of laughter swirled around the kitchen. Now that I have my own family, I like carrying on that same tradition and so, I’m constantly on the lookout for new recipes to try when my own creative spark doesn’t automatically go off. Last year, I came across a gem of a book called The Paleo Kitchen by Juli Bauer & George Bryant. 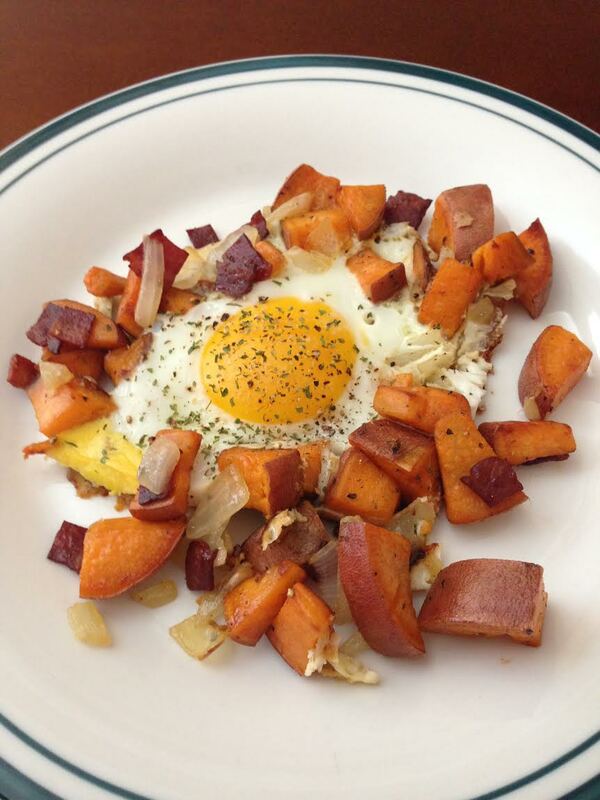 There is a Sun-Dried Tomato Sweet Potato Hash recipe in there that I put a slight but simple twist on to make the most delicious breakfast that doesn’t take much time at all to whip up. Sweet potatoes on their own are already so tasty that you really don’t need to do much to make a dish involving them taste good. Set your stove to medium heat and melt your coconut oil. 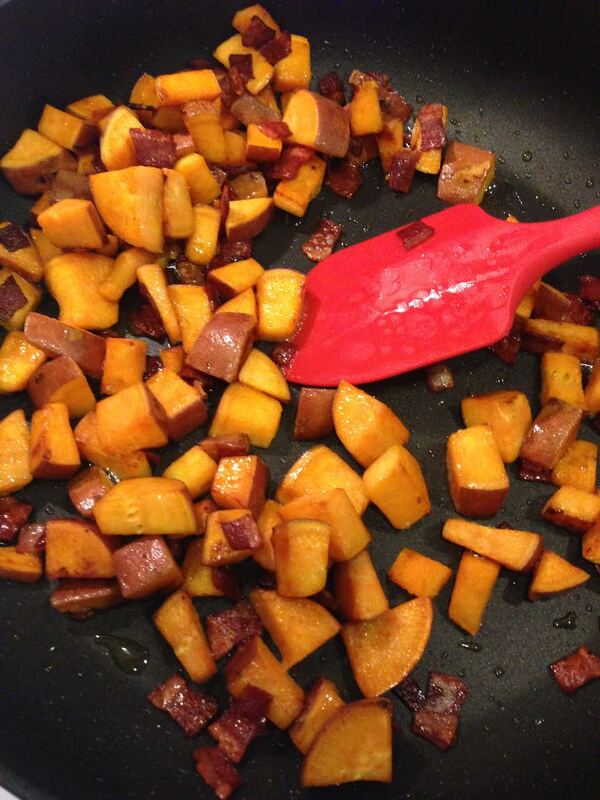 Add your diced sweet potatoes and stir them around for a few minutes to get them nicely coated and sizzling in the coconut oil. Cover the pan with a lid and cook for 5 minutes, then, remove the lid and continue cooking the sweet potatoes for another 10 minutes until they’re nicely browned on all sides. 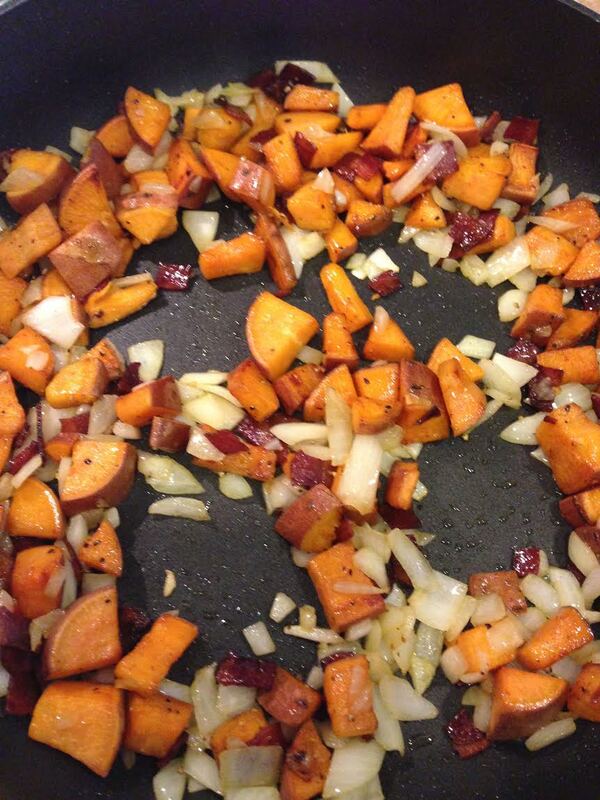 Once the sweet potatoes have browned, add your onions and keep cooking them until they turn translucent. Sprinkle with salt and pepper. 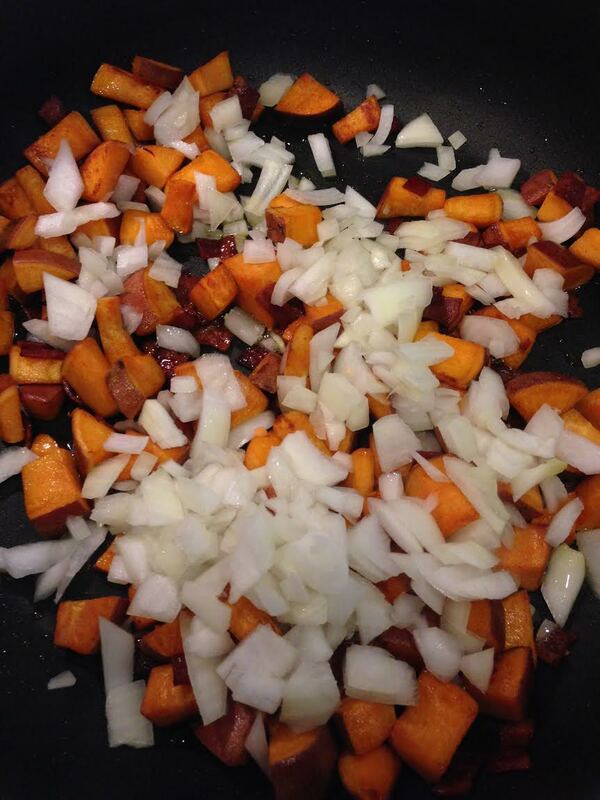 Add four wells into the sweet potato and onion hash, and crack your eggs into the wells. How long you cook your eggs will depend on the firmness at which you want them. I usually find that cooking them for a few minutes, so that they are not completely hard but slightly runny, is plenty to my liking. Remove from heat. Garnish with basil and serve. 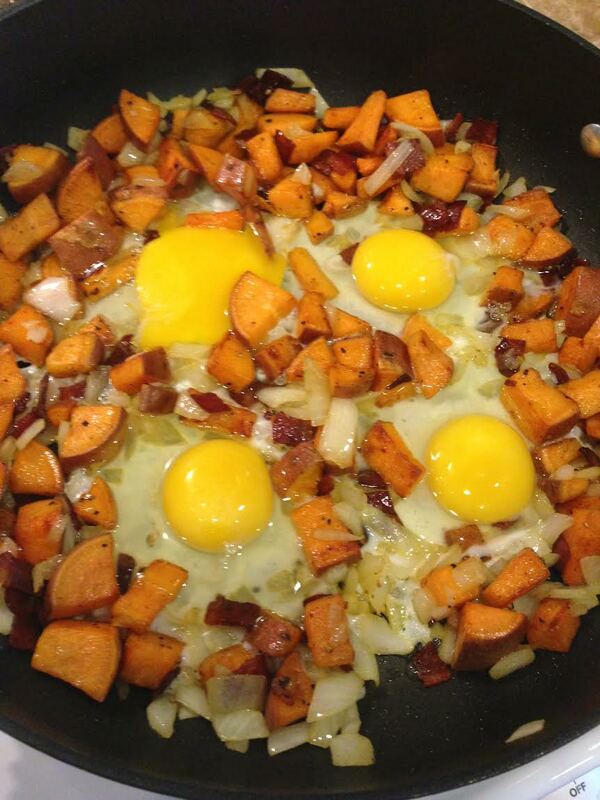 The combination of coconut oil, sweet potatoes, and eggs gives this dish an incredibly rich, satisfying, and warm taste. It is sure to leave a lasting impression if you decide to incorporate it into your own Saturday morning tradition. One of my passions in life has always been writing. Ever since I was in elementary school, I was known as the little girl who would sit on the edge of the Bark Box with a blank notebook and pen in hand, creating make-believe stories. 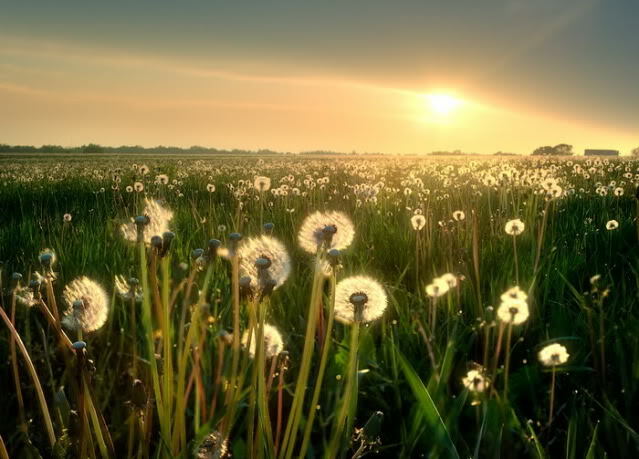 The world was truly my canvas, and the sky was the limit as far as my imagination was concerned. I filled notebook after notebook up, and would spend my leisure writing letters to my favorite authors, as well as sending them my manuscripts (all, of which, at that tender age kindly got rejected, and understandably so.) I remember spending much of my childhood at the public library in my hometown, which was surrounded by a beautiful pond with cool, glistening water and a million ducks that would be waddling around. At the time, that library seemed enormous to me, and I felt like a grain of sand that occupies just one tiny fragment of a warm, sandy beach, and a must bigger picture. As I grew older, my passion for writing stayed with me. In high school and through the duration of college, I majored in English, graduating from a university with my degree in English. However, as I became an adult and immersed myself into a world of work and responsibility, my passion, inevitably, seemed to take the back burner. But, I’m a firm believer that our hearts ultimately lead us back to whatever we are inherently passionate about and so, here I am, sharing my story with each of you. I want to personally thank all of my followers for staying loyal and continuing to follow my blog, even though my updates have been so infrequent these past few years. I hope to change the frequency of my posts, especially now that I can really express my creativity on such a wider scale. I look forward to providing you with fresh, exciting content for 2015! Happy New Year! As we advance into 2015, I know many of us have the goal to eat healthier and lose weight. The recipe I’m about to share with you today will help you on your weight loss journey and not impede your progress. I actually got it out of one of those Costco cookbooks they pass out for free in December during the holidays. I modified the recipe a bit (the original called for flank steak and I changed a few other ingredients here and there) and I have to say that the end result was amazing! Let’s get started. Cuban dry rub: in a small bowl, stir together all the ingredients. Set aside. Cilantro chimichurri sauce: place all ingredients in blender and puree until smooth. Set aside. Carne asada: using the Cuban dry rub, rub the pieces of carne asada on both side. Place the carne asada in the refrigerator while prepping the onions. Brush the sliced onions with olive oil and season with salt and pepper to taste. Place the rubbed carne asada on the grill and cook to the desired internal temperature. I used a George Foreman grill and grilled mine until well done for 9 minutes. Remove from grill and let rest, tented with foil. Add the sliced seasoned onions in the grill. When the onions are tender, place in a mixing bowl. Add a few splashes of lemon juice (or squeeze some fresh lemon on top) to the onions, season with salt and pepper, and add some sprigs of cilantro; toss gently and set aside. To serve, arrange the carne asada on a platter, scatter the warm grilled onions on top, drizzle with the cilantro chimichurri sauce, and garnish with some cilantro sprigs. I served mine with green beans on the side that I sauteed in a dab of butter, garlic, and salt. Yum!